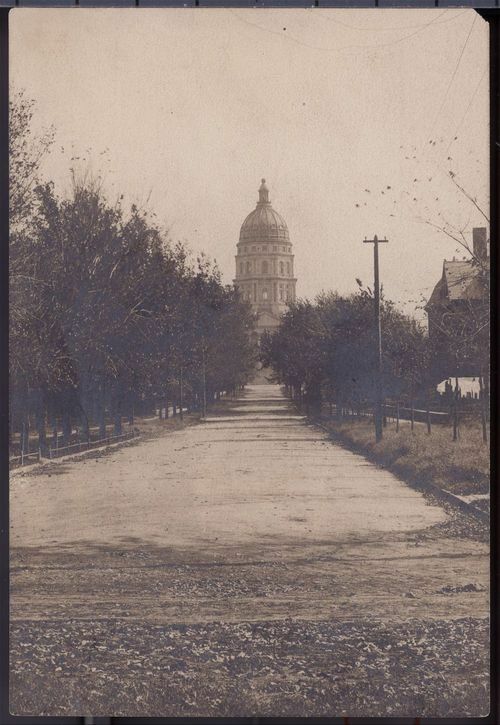 This sepia colored photograph shows a view of the capitol in Topeka, Kansas, looking east, from the corner of Ninth and Polk Streets, on the campus of Bethany College. Located on twenty acres of land once owned by Cyrus K. Holliday, work began on the capitol October 17, 1866 when the cornerstone was laid for the east wing. Thirty-seven years later, the statehouse, an example of French Renaissance architecture and Corinthian details, was completed at a total cost of $3,200,588.92.